Construction unions Unite and GMB held a series of demonstrations on 12th April over the exploitation of workers. The protests focus on several Danish firms who are building of major energy from waste projects in the UK. Workers are being paid up to 61% agreed industry rates. Some workers being paid the minimum wage and financing their own accommodation and travel. Representatives from the two unions handed in a petition containing over 5,000 signatures to the Danish embassy. The petition called on the Danish government to launch an investigation into the scandal. Protests took place at energy from waste projects in Rotherham and Sandwich in Kent. A further demonstration was held outside the offices of Babcock & Wilcox Vølund in Solihull, West Midlands. Babcock & Wilcox Vølund, which is building the Rotherham project (worth £165m). It sub-contracts large chunks of their work to Croatian company Duro Dakovic which pays workers as little as £7.50 an hour. The industry agreement (NAECI) has a basic rate of £16.97 an hour with an hourly bonus of £2.37 an hour. Burmeister & Wain Scandinavian Contractor is the principal contractor at the Sandwich project. The project is worth £175m. The company refuses to allow unions access to the workforce. They don’t pay the hourly bonus, industry sick pay, enhanced holiday pay, travel and accommodation allowances and other benefits. Copenhagen Infrastructure Partners finances the project. They are the investment arm of Pension Denmark. The organisation has clear corporate social responsibility policies which apply to the supply chains domestically. But these policies are being flouted abroad. On Monday 10th April a group of activists from Unite and the GMB held a protest outside the offices of Pension Denmark. The protesters drew attention to the ongoing exploitation. The Danish government has clear policies in place which prevent undercutting occurring in Denmark. However this does not legally prevent Danish companies from exploiting workers abroad. Unite national officer for construction Bernard McAulay said, “Construction workers are angry that Danish companies are exploiting workers and undercutting pay rates, to boost their profits. GMB national officer for construction Phil Whitehurst explained that these engineering, procurement and Construction (EPC) management companies, funded primarily by Copenhagen Infrastructure Partners – the investment arm of Pensions Denmark, have maintained they will not support any form of undercutting or exploitation by their supply chain. “We have presented evidence to them highlighting exploitation and social dumping practices that, if carried out in Denmark, would carry a custodial sentence,” he noted. 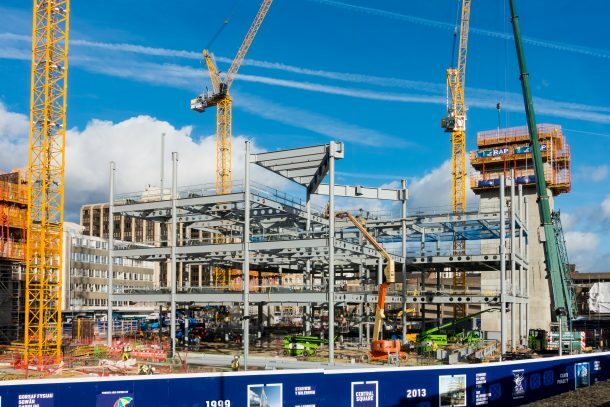 “We have endeavoured to negotiate with the construction companies responsible, but they refuse to sign up to national agreements in the UK, such as NAECI, which would put everyone on a level playing field. They appear to be worried the audit system would expose allegedly corrupt practices of exploitation and social dumping.